The IAP2 Federation Members-at-Large Core Values Awards Program is open for submissions. IAP2 developed the Core Values Awards to recognize the “best of the best” and celebrate those who effectively use the Core Values in innovative ways in complex circumstances to make better decisions that reflect the interests and concerns of the people and entities potentially affected by those decisions. Learn from past Core Values Awards winners. IAP2 International Associates and IAP2 Members from locations where the IAP2 Affiliate does not offer an awards program will be eligible to submit to the Member-at-Large Awards program and the winners are eligible to compete for the international prizes. Submissions will be accepted until July 30, 2018. IAP2 Affiliates offering Core Values Awards programs in 2018 include IAP2 Australasia, IAP2 Canada, and IAP2 USA. Submissions from those locations are not eligible for the Members-At-Large program. Please refer to those Affiliates for Core Values Awards information. IAP2 releases new resources to communicate the core principles and resources available through IAP2 and its affiliates. 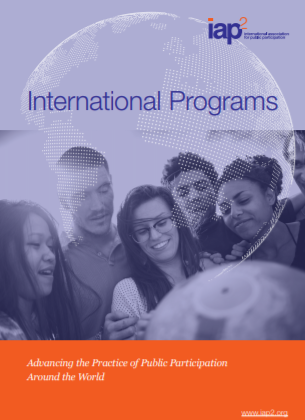 These brochures provide members of the IAP2 Network additional resources to introduce practitioners, thought leaders, and others to the core values and principles of IAP2, as well as to the programs available through IAP2. The 24 May symposium in Pipitea Wellington is just around the corner. The theme of the Symposium this year is “Are we there yet? The journey so far... A review of engagement practice and the possibilities that lie ahead”, which will be exploring how Community and Stakeholder Engagement is journeying forward as a practice; as an essential part of projects and organisations; and as a profession. Are we there yet? Come along and find out! IAP2 Australasia Training have been working with a project panel of stakeholders to develop two new modules - Engagement Facilitation (available from May 2018) and Engagement Evaluation (available from October 2018). The first module, Engagement Facilitation, aims to upskill engagement practitioners in planning for a facilitation process and to manage the situation in which they find themselves. Email training@iap2.org.au to learn more. Save the date for the 2018 IAP2 Australasia Conference which will be held at the stunning location of the InterContinental Sanctuary Cove in Queensland from 23 – 25 October 2018. A fresh programme “Shake it Up!” is being developed for what we plan to be the biggest IAP2 Australasia Conference ever. The Call for Papers has been released! Submissions close Friday, 1 June 2018. What happens when your city’s growth suddenly explodes and new initiatives demand public participation? “Engagement fatigue” and staff burnout follow — that’s what. The City of Austin, Texas, has seen its population grow over the last decade to the tune of 100 people per day, and the situation has not been helped by often vitriolic divisions of opinion. The solution? The Conversation Corps: a team of trained volunteer facilitators, dedicated to promoting civil dialogue and pushing the envelope of P2 best practices. We’re excited to welcome folks from Austin with P2 is a Team Sport, the story of their five-year journey. You’ll get some on-the-ground insights on promoting a culture of civil discourse and how to work with other agencies to grow a P2 culture. This is just one of nearly 30 sessions, plus workshops, panel discussions, and field trips at the 2018 IAP2 North American Conference, Sept. 5 – 7 in Victoria, BC. Read more about the Conference and take a look at the Schedule-at-a-Glance to see what’s on offer. REMEMBER: register on or before June 30 to take advantage of the early-bird registration rates! And book your room soon at one of our three partner hotels: they’ll be going fast! IAP2 Southern Africa Affiliate Board Member, Timothy Hart is presenting a paper on “Full project cycle SIA: optimising social outcomes.” This paper describes work in progress to develop and implement an integrated full project cycle SIA approach to optimising the outcomes of social projects and investments in mining communities. The paper titled “Social Management in Water Infrastructure Projects” authored by IAP2 Southern Africa Board Member Thato Shale, Ph.D., will share insights on how TCTA manages projects and social aspects through effective stakeholder management and local community participation, in order to maximise projects benefits and minimise negative impacts. “Balancing Tensions to Achieve Better Outcomes” is being presented by Cassandra J. Hemphill, Ph.D., IAP2 Federation professional development manager. Dr. Hemphill will share best practices used by environmental management practitioners to respond to and incorporate public comment to reach more robust, sustainable decisions. IAP2 Trainers, Tanya Burdett and Tisha Greyling will be delivering pre-conference training, “Public participation in impact assessment: Effective communications and engagement approaches and techniques.” The course is tailored for the conference theme, though it will utilize IAP2’s Public Participation for Decision Makers materials, which look at effective foundations in participation and how to best integrate engagement into proposal development and impact assessment. The IAP2 Southern Africa Board of Directors is pleased to announce major updates to the IAP2 SA website. In addition to working on the "look and feel" of the website, updated pages include the home page, News, Events 2018, and membership and contact us forms and processes. IAP2 SA represents P2 practioners from Angola, Botswana, Lesotho, Madagascar, Malawi, Mauritius, Mozambique, Namibia, South Africa, Swaziland, Zambia, and Zimbabwe. If you are from one of these countries, show your support and join today! IAP2 Indonesia plans to bring the 5-Day Foundations in Public Participation (5 Hari Pelatihan Partisipasi Publik) program to the Indonesia School of Government & Public Policy campus, outside DKI Jakarta Province at the end of July (translated program brochure). The deadline for the IAP2 Canada Research Committee call for Expressions of Interest to prepare two White Papers for 2018 has been extended to 15 June. Topic 1: Provide tools and techniques that support the achievement of equity and align communication in community representation with diverse audiences, including non-English speakers. Topic 2: Explore methods to evaluate P2’s Return on Investment, to increase executive support and strengthen participation processes globally. White Papers are to inform members about a topic in a concise format (1,500 - 2,000 words), integrating academic research and case studies. IAP2 Professional Development Manager Cassie Hemphill attended the March 2018 Innovations in Participatory Democracy conference in Phoenix, Arizona, as both a representative of IAP2 and as a faculty member of the University of Montana. She co-presented a session called “Using art to explore participatory democracy work and connections.” Participants in this interactive workshop used art to explore their connections to participatory democracy, what led each of them to their work on improving democracy, and what each offers to the field. Participants explored how they are connected within their communities, both geographical and intellectual, and how they can connect with others across interdisciplinary and organizational boundaries to strengthen citizen engagement in democracy. 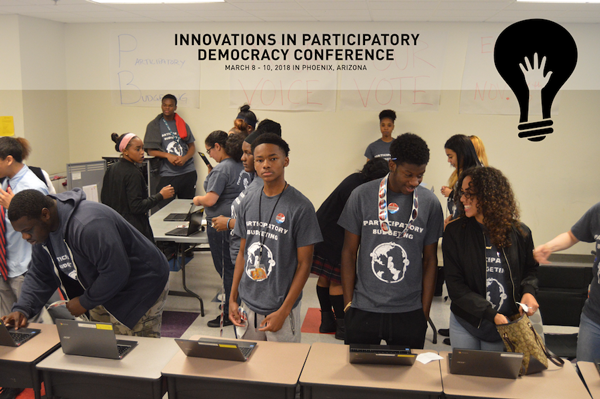 The IPD conference brought together community leaders, government officials and staff, practitioners, researchers, funders, young leaders, and technologists from around the world to explore innovations that empower community members to make real decisions and directly participate in government. Many participants said they had heard about IAP2 and had seen our materials, especially our Spectrum and Core Values, but this was the first time they had met an IAP2 representative in person. In 2017, IAP2 piloted a new process for becoming a Foundations Licensed Trainer. Throughout 2017, feedback on the process was collected from applicants, faculty, trainer candidates, and staff. IAP2 has used that feedback to re-design the first two steps to increase efficiency and provide more transparency for applicants. IAP2 will continue to incorporate feedback from the 2017 pilot and the redesigned 2018 program to be responsive to its members’ needs and improve its processes. The curriculum is still being developed. More details will available in summer 2018. Post or search career openings in the field of public participation in the IAP2 Career Center. Postings are moderated for positions within or closely related to public participation. Broaden your search and post your P2 positions starting today!